Zappala Family Scholarship For the Alcohol and Drug Abuse Counseling Certificate – Applications Due July 2nd! The Zappala Family Scholarship, established in 2013, supports students enrolled in the UCLA Extension Alcohol & Drug Abuse Counseling Certificate. 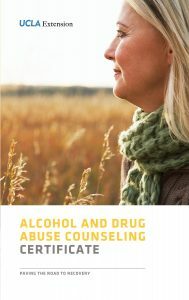 When it comes to the cycle of addiction, skilled and well-trained substance use disorder counselors make all the difference in the lives of those who struggle with the disease. This scholarship was created to provide qualified individuals the opportunity to pursue professional careers as addiction counselors. ensure that expert counselors are readily available for other families like theirs. For new students registering and beginning the program in Fall 2018, partial scholarships awarded to eligible candidates. Scholarship awards provide 50 percent of course registration fees in the Alcohol and Drug Abuse Counseling Certificate. Fee reduction will apply to all courses in the certificate EXCEPT the Study Skills one-day course. The Study Skills one-day course is a prerequisite to the certificate program if the candidate has not attained a minimum of an Associate Degree (AA). If required, the Study Skills one-day course must be completed before the scholarship is awarded. Scholarships are nontransferable and will expire within four years of award date. Scholarships are not awarded based on financial need and applicants are not required to submit financial documentation. The scholarship supersedes any other discounts available. Must complete the prerequisite Study Skills one-day course offered on Sept. 15, 2018, if they DO NOT have a minimum of an AA degree documented by official transcript. Must submit their application by 11:59pm (PDT) on the deadline of Monday, July 2, 2018. Applications will be accepted starting Monday, April 2, 2018, at 8am to Monday, July 2, 2018, at 11:59pm (PDT). Only complete applications will be considered. UCLA and UCLA Extension employees and their family members or dependents are not eligible to apply. Should be aware that eligibility criteria for all final candidates will be checked and confirmed by UCLA Extension. Must be a new student to the program registering in Fall 2018. Current students are not eligible for the scholarship. Applications are due by July 2nd. Click here to apply.